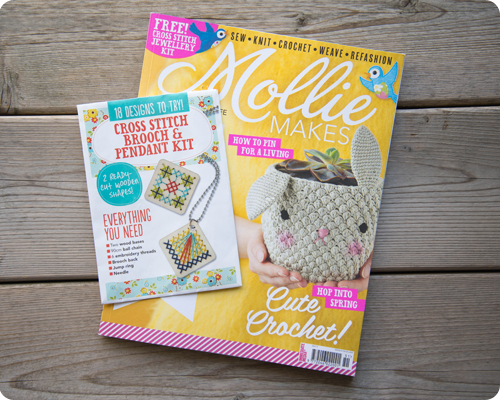 Up until a few months ago (when they ceased publication) I had a subscription to the US Edition of Mollie Makes. Oh I loved that magazine - the patterns, the profiles of craft shops (sometimes in cities that I have visited), the beautifully styled photographs - it was a monthly dose of creative and crafty inspiration that I really looked forward to. I was quite sad when I learned that it was coming to an end. 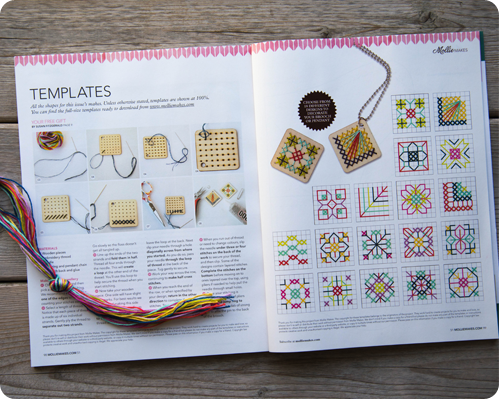 To finish out my subscription, I have been receiving the UK edition of the magazine, with the perk of a little craft kit included with each issue. 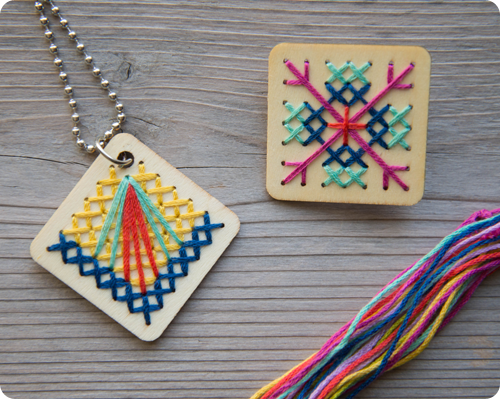 This past month's kit was for a cross stitch necklace and brooch. It has been ages since I did any cross stitch - I used to be quite avid in this craft - so I thought I would give this a try. There were many templates to choose from in the magazine. After settling on my designs I set to work and created this necklace and brooch. It was a quick little make, a modern take on the old craft of cross stitch, and I quite like how it turned out. Of all the Mollie Makes mini craft kits that I have - from my subscription and from the odd magazine I have purchased on its own - this is the first one that I have actually made. Maybe I should get going on some of the others...they seem the perfect thing for learning a new skill (I have one with embroidery, and embroidery is something I am interested in trying) or for dusting off an older skill and using it in a new way, like this kit. Have you tried any new crafts or revisited some older ones lately? I'd love to hear about it. Fabulous!!! Nothing new hear - hope to get back to sewing. 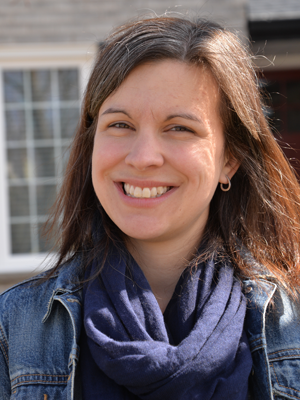 Always love seeing what you are creating, Rachel! !